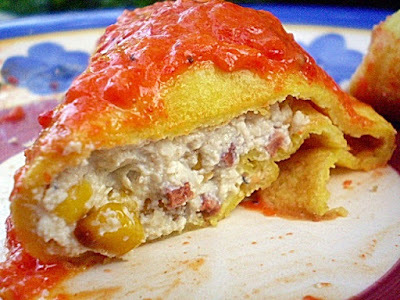 This is a recipe I developed more than 10 years ago, but it's still a great one for this time of the year, when fresh corn is available (though you can make it with frozen sweet corn kernels, of course). It's an easy make-ahead main dish for a company dinner, colorful and delicious, but it makes an elegant brunch dish as well. The components of the dish, the "ricotta", vegan Bechamel, and crepes can be made well ahead of time, and the sauce (Coulis) can be made early in the day and reheated-- and the Coulis is the easiest sauce in the world to make. The crepes can be frozen well before you use them. 1 recipe Bryanna's Vegan Ricotta (see 2 recipes here) -- you might have a bit left over. Process all ingredients in a food processor or blender until very smooth. No need to "rest" the batter first. 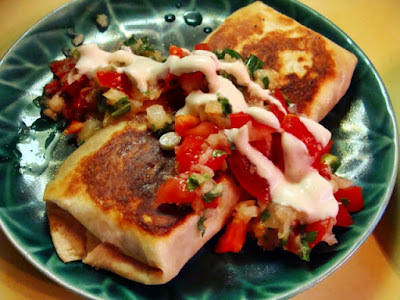 Tofu crepes are made just like ordinary crepes. Heat a nonstick 10-12" skillet over medium-high heat and wipe it lightly with oil before making each crepe. 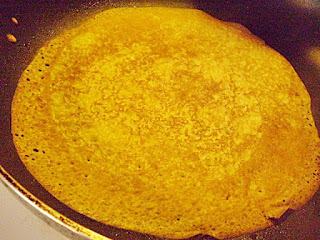 Use about 1/4 cup of batter per crepe (stirring the batter before you make each crepe), rolling and tilting the pan until it evenly covers the bottom. Cook for a few seconds, or until the top looks dry. Carefully loosen the crepe with a spatula and flip it over. After a few seconds the other side should be dry. Fold into quarters or roll like a jelly roll and place on a plate (or leave them flat if you are going to stack them with filling). If you are going to use the crepes shortly, cover them with a clean tea towel. If you are going to store the crepes for later use, let them cool and place in a plastic bag or rigid container (with pieces of waxed paper in between each crepe) and refrigerate for up to 3 days, or freeze them for future use (thaw thoroughly before filling). Mix together all of the ingredients in a bowl and set aside. Mix together all the coulis ingredients in a blender or food processor and process until smooth. Heat gently in a microwave-proof bowl, or in a saucepan over low heat. Divide the filling into 12 equal parts. Place each portion of filling down the center of one crepe and roll it up. If it seems like too much filling, cut it down to your liking, but I like these well-filled. Place the filled crepes in a large rectangular baking dish (in one layer-- use another baking dish, if necessary) lined with cooking parchment. The crepes can be filled ahead of time and refrigerated for a few hours or overnight, well-covered. When you are ready to serve, heat the oven to 400°F. Cover the baking dish with foil and bake for about 20 minutes if the crepes have not been refrigerated, or 30 minutes if they have. 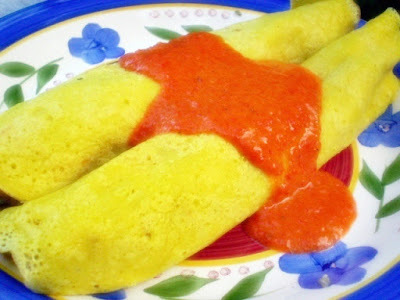 Serve the crepes hot with the reheated Red Pepper Coulis. Nutrition (per 1 filled crepe with sauce): 251.2 calories; 23% calories from fat; 7.0g total fat; 0.0mg cholesterol; 449.3mg sodium; 513.5mg potassium; 30.9g carbohydrates; 3.7g fiber; 5.2g sugar; 18.3g protein. A few days ago I was craving "Torta"-- an Italian savory vegetable tart. or pie made with olive oil pastry and common all over Italy. This type of pie is especially common in the Italian province of Liguria, on the Italian Riviera, where my paternal grandmother’s family originated. It’s a large, thin double-crusted tart baked on a pizza pan. The thin olive oil dough (a little different from the olive oil pastry I used for a fruit pie here) is surprisingly pliable and easy to work with. Though now considered a gourmet treat, torte were born of necessity—in earlier times wheat was expensive in that region and the thin dough used a small amount of flour and oil to feed quite a few. The filling could contain anything that was plentiful in the garden or on the farm, plus wild greens, mushrooms and herbs gleaned from nearby meadows, hillsides and forests. For this torta, I wanted to use up both kale and summer squash from our garden, but I wanted the filling to be a simple one because I didn't have alot of time to spend in the kitchen. The result was delicious! It's good hot or cold or room temperature and we enjoyed it the leftovers for lunch the next day (great picnic fare!). I will use this simple mixture again with other veggies. You could substitute any other type of greens for the kale, and you could use cooked potato, winter squash or eggplant instead of the summer squash. Whisk together the flour and salt in a medium bowl. Drizzle in the olive oil and mix with a fork or your fingers -- there will be some small lumps, and that's fine. Drizzle in the cold water slowly, mixing with a fork. When it comes together, knead it gently into a ball and cover with plastic wrap or a damp cloth. Heat a large pot of water over high heat until it boils. Add the sliced kale and boil for about 30 seconds, turn off the heat and place the lid on the pot. Let stand while you place the zucchini rounds and/or pattypan squash wedges and sliced onion on a baking sheet, and sprinkle them with the 2 tablespoons of olive oil, 1/2 teaspoon salt, pepper and mint. Mix gently with your fingers and spread the mixture out again. Place the the baking sheet under your oven's broiler on High, about 4 inches below the heat source. Broil, watching carefully, until the vegetables begin to brown and are softened. Immediately remove them from the oven and turn off the broiler. Preheat the oven to 375˚F. Now drain the kale from the pot in a colander and run cold water over it. Squeeze as much water out of the kale as possible. Combine the kale and zucchini/onion mixture in a mixing bowl. In a blender or food processor, mix together the silken tofu, nondairy milk, nutritional yeast, starch or alternate, and miso until smooth. Pour this into the bowl with the vegetables and mix gently. If you like, add some vegan Parmesan to taste-- a couple of tablespoons, if you like. Spray or lightly brush a 14” pizza pan with oil and sprinkle lightly with flour. On a floured surface (I use a large sheet of baking parchment sprinkled with flour) flatten the ball of Dough a bit and, using the “roll from the center forward, quarter turn, repeat” method, and flouring lightly as necessary, roll the dough out into a 18”-in-diameter round (doesn't have to be perfect!). This dough will roll out thinly quite nicely, but watch for tearing. To transfer to the pan, sprinkle the round lightly with flour, fold loosely in half and then in half again. Transfer the dough carefully to the prepared pizza pan and carefully unfold the dough, which will overlap the edge of the pan by a few inches. (OR roll it up around the rolling pin, loosely, and transfer it to the pan by starting at the top of the pan and unrolling the pastry over the pan.) 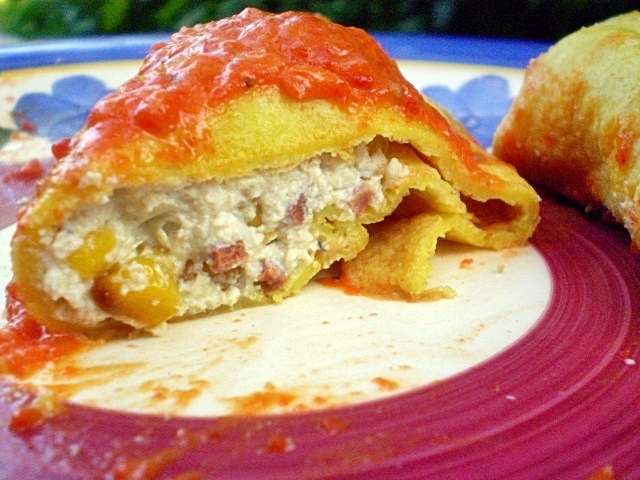 Evenly spread the Filling into a 12-inch circle in the center of the dough. If you like, sprinkle the Filling with a handful of shredded vegan melting cheese. Carefully bring the overlapping dough up around the filling, to make a freeform pie. Pleat the edges of the dough over the filling, leaving an open circle in the center. Brush or spray the dough lightly with oil. Bake about 35 minutes, or until the torta is golden and starting to brown. Place the pan on a cooling rack. Cut the torta into 6 or 8 wedges and serve hot or at room temperature. Nutrition (per serving): 377 calories, 136 calories from fat, 15.5g total fat, 0mg cholesterol, 521.5mg sodium, 649.5mg potassium, 47.6g carbohydrates, 4.8g fiber, 2.9g sugar, 14.6g protein. I have alot veggies to use up this week, so I was busy this morning! The first thing I made was a lovely soup from Nava Atlas' wonderful book, "Wild About Greens". It's called Italian-Style Potato & Escarole Soup, but the recipe notes add that broccoli rabe (rapini) can be used instead of the escarole-- just the thing to use half of the big bunch of rapini in my fridge. 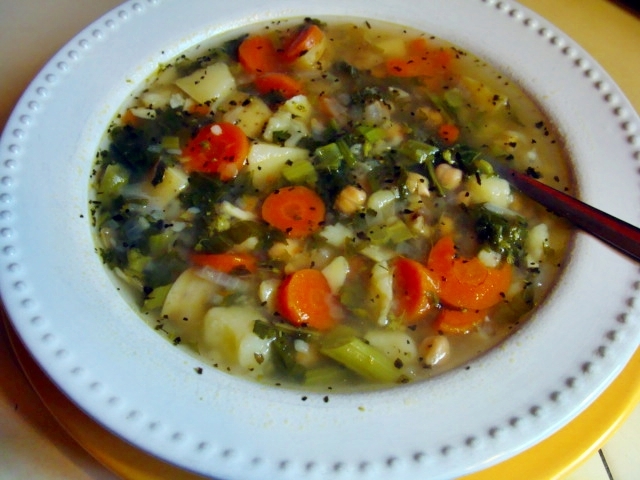 This veggie-full soup is easy to make and so delicious! We're having it for dinner tonight. You can access the recipe from Nava's website here. I followed it exactly, but used broccoli rabe (rapini) for the greens. Do give it a try (and check out the book, too). Thanks, Nava! The second thing I made (which we're also having for dinner) was Tabbouleh. 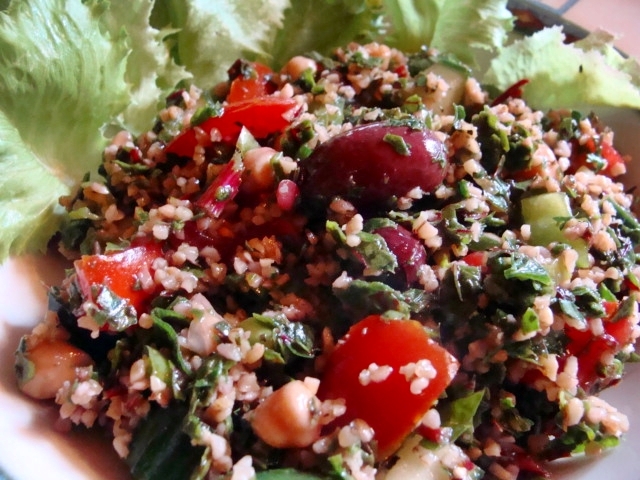 Tabbouleh should be vibrant and flavorful. A Lebanese friend told me that an authentic tabbouleh must have LOTS of parsley—it’s not supposed to be just a bulgur salad with a little parsley in it. It should be very green. Italian parsley is the tastiest, but you can use ordinary curly parsley, or a combination. Fresh mint and dill add delightful fresh flavor. 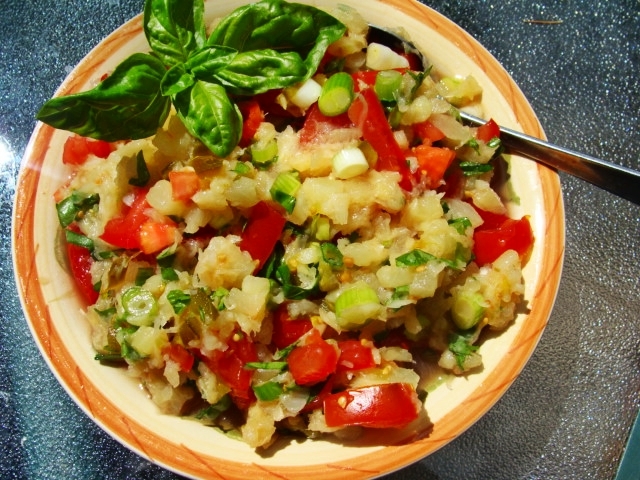 Today I made the following Tabbouleh recipe, my standard, in order to use up some ripe tomatoes. But, I soon realized that I was out of parsley! I decided to go ahead with it and try using minced chard instead, since I have lots in the garden. At the last minute I decided to add a 1 1/2 cups cooked chickpeas to make a full-meal salad. It's delicious! (PS: I found that the dressing needed more lemon juice than usual with the chard.) I give you the directions for using chard instead of parsley in the recipe intro. 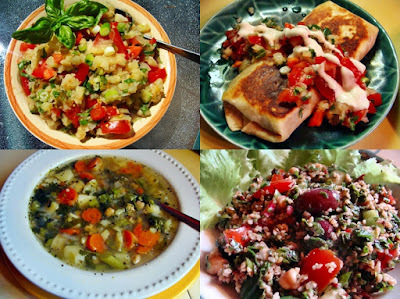 The traditional (and very attractive) way to serve Tabbouleh (see photo above-- probably my most artistic presentation ever! ) is to mound it in a serving bowl or platter with a rim and surround it with crisp Romaine lettuce leaves to use as scoopers. Decorate the top of the salad with tomato wedges or halved grape tomatoes, sprigs of fresh mint and parsley, and black Kalamata olives. ALLERGY NOTE: If you are allergic to wheat, use cooked and cooled quinoa instead of bulgur. This popular Middle Eastern salad has long been a staple for vegetarians, but it often contains 3/4 cup or more of olive oil for a salad of this size. My version contains far less oil, but none of the flavor is missing. In a large serving bowl mix together the bulgur and boiling water. Let stand while you prepare the vegetables and dressing. Add the olive oil (if using), lemon juice, salt and pepper to the Oil Substitute and whisk or shake together well. Set aside (or chill, if you used the Oil Sub while hot) until time to add to the salad. When the bulgur has absorbed all of the water, add the remaining salad ingredients and the dressing. Toss well. Taste for lemon juice, salt and pepper, adding more if needed (I found that I needed more lemon juice when I used chard in place of parsley). Refrigerate until serving time, or allow to come to room temperature, if you prefer. I used large flour tortillas and filled each one with 1 and 1/2 veggie dogs, each sliced lengthwise in half, then sprinkled with some grated veggie cheese. Betsy used a pineapple salsa from a jar, but I didn't have anything like that in the house (remember, I live on an island!). So, I rummaged around, found a can of crushed pineapple and made up my own recipe with what was available. It was a success and we really enjoyed our fancy hot dogs! Mix all of the ingredients together in a bowl. Taste for chili heat and salt and adjust if necessary.